According to a recent news report from NECN, a driver drove his truck off the upper deck of Interstate 93 in Boston and landed on the lower deck. Incredibly, he survived. Police say the 33-year-old defendant has been arrested for drunk driving. Surveillance footage shows defendant allegedly hitting a light pole, exit sign, and a section of fence before he “launched” off the upper roadway surface and landed on the lower deck in the southbound lane. First responders pulled defendant from the wreckage and took him to Massachusetts General Hospital (MGH) in Boston. After a preliminary investigation, police issued a summons for defendant to appear in Boston district court to face charges for drunk driving. Defendant suffered broken bones, fractures, and bruises but said he is glad he didn’t hurt anyone else. Police further alleged defendant stated he was at a friend’s house prior to the accident, where he had “a little bit to drink” and was also tired from working his third shift job and shoveling snow. He was shoveling snow to earn extra money. Defendant also reportedly took responsibility for the crash, and, while roads were slick that day, he took responsibility and did not blame the accident on road conditions. When asked if he considers himself a safe a driver, he said yes but that he wasn’t acting responsibly when the accident occurred. As our Boston drunk driving accident lawyers understand, accidents far less dynamic that this one can end with serious personal injury or death. It should also be noted that, while everyone seems amazed defendant survived “relatively unscathed,” an innocent victim with broken bones, fractured bones, and bruises might not consider themselves so lucky. Whenever someone operates a motor vehicle under the influence of alcohol or drugs, they are taking a serous risk, not only with their own safety, but also with the lives and safety of others. 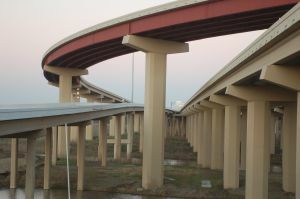 We can easily imagine how an accident involving a car falling of an overpass could cause harm to someone else. If you are ever in a serious car accident that is someone else’s fault, you want to make sure you or someone else calls the police to the scene of the accident. In some cases, you may even be required by law to call the police, even if the accident was not your fault. This will also prevent the at-fault driver from claiming you hit him or her and ran from the scene. These false claims of hit-and-run are actually fairly common. A police report that states the other driver is determined to be at fault will also be extremely helpful in proving your car accident negligence lawsuit. This is especially true in the case of a drunk driving accident where police can administer standardized field sobriety tests and a breath test, blood test, or urinalysis to determine if the at-fault driver in the car crash was operating a motor vehicle under the influence of intoxicating liquor or drugs.